I’m just going to throw this out there. I don’t disagree with anyone here. Just adding to the conversation. Isn’t a more forgiving club suppose to “hit the ball straighter”? That’s what the extra MOI is for? I can draw and fade my irons that are in the GI category, but sometimes it just doesn’t work (probably me 100%). Could with the i200’s too. So if we are all trying to shape our shots we should all play a less forgiving iron? Both the design of what is consider gi and sgi and to an extent the new players distance iron and the ball are designed to go straighter and minimize side to side misses. one thing I find interesting is the desire of amateurs to hit 5+ yard draws or fades when the best players in the world have 5 or less yard movement on their shots. I think everyone here has valid points. Yes path and club face make the biggest distinction in shot shape. But certain clubs are geared at promoting high straight shots for higher handicap golfers. So I would say with the weight profile of blades it is often easier to hit a variety of shot shapes. I like sideways rainbows out there. The more bend the better. So we are talking about 15 feet or less of movement. So far I like Steddy's reply. I too am a low single digit hcp'r. Do I "work" the ball? Not unless I have to and even then that usually means me hitting a fade/slice or a low running hook to get out of trouble. My natural shot shape is a draw. When the pin is back right for example; I usually don't try to alter my swing for a fade. I hit my natural and comfortable shot - two putt and move on. I play cavity back irons and can shape the ball right or ...left if I have too. I also know exactly where on the face I struck it. I don't need a blade to learn or hone my ball striking. My irons already provide plenty of feedback. Sorry bud but I disagree. If you take two samples from each extreme and attempt the same hook/draw, it will be easier (as the OP inquires) to obtain the desired shot with the blade. It’s physics. The shape and design of the head will restrict or promote certain behaviors from that object struck. If that a majority of that weight and mass is in the sole, the club will promote or restrict certain movement. Do the physics of a gi club make it easier or harder to manipulate the head in certain ways? Perhaps, but it would vary by golfer. The physics and geometry of the club will determine whether it’s easier or not to move the ball. That’s all I’m saying. Anyone that has played golf knows that you can hook or slice any club . So I agree that the ball does the same thing, but the question becomes magnitude. GI clubs are designed to impart backspin to generate lift. CG is lower and back than muscle back style clubs. So while I may hit the ball with both clubs using the same path and face angle, the added backspin of the GI offsets the sidespin to make it curve less. Actually most gi clubs spin less because of the low and back cg. 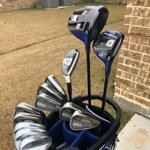 Same concept as drivers lowers spin and raises launch. I am pretty sure back CoG raises launch and spin. Driver weight forward lowers spin. I think they spin less if you aren’t looking at same loft and just looking at the number on the bottom of the club.